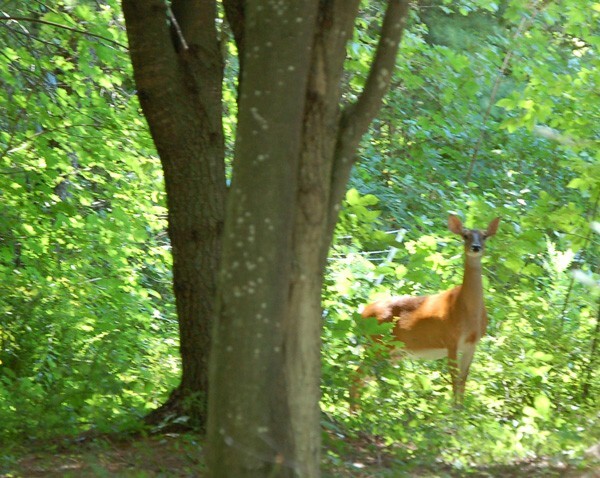 I was up in Wolfeboro, New Hampshire this weekend for a family get-together and up the street from my sister's home we spotted a family of deer. 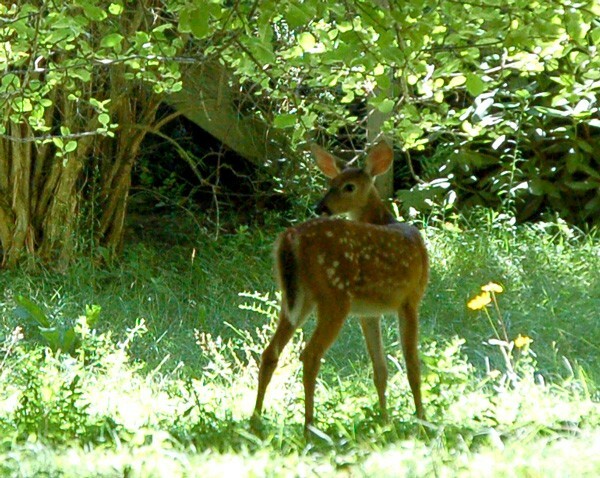 There were actually two fawns, but most of the time they were side by side, giving me lots of pictures that looked like one mutant fawn with 8 legs and a head on each end of the body. Also, the lighting was pretty poor, so the above two pictures were the best I could get. Sorry they're kinda blurry. At least my camera still works after being taken apart. The living room and dining room in my condo share the same wall, so when I was painting the living room a pale yellow a few years ago, I just sort of stopped when I got to the edge of the dining room. I feathered the edge so the yellow blended into the white of the dining room, but the color change was still noticeable if you looked for it. Since my condo is for sale, I figured I may as well finish the paint job to make it look a bit more tidy. I had originally bought two one gallon cans of paint three years ago, but never even opened the second can. Well, today I was in for a bit of a surprise when I finally opened the full can. As soon as I popped an edge of the cover, paint sprayed out like it was from a shook up soda can. It shot over three feet across the room and got me nicely in the face and eyes, too! Fortunately I had a drop cloth down and all the paint (other than what was on my face) landed on the drop cloth. After I completely took off the lid, the paint was even bubbling and was overflowing from the can. It was all pretty weird. I never knew paint could ferment or get fizzy. I wonder what sort of chemical reaction was going on. 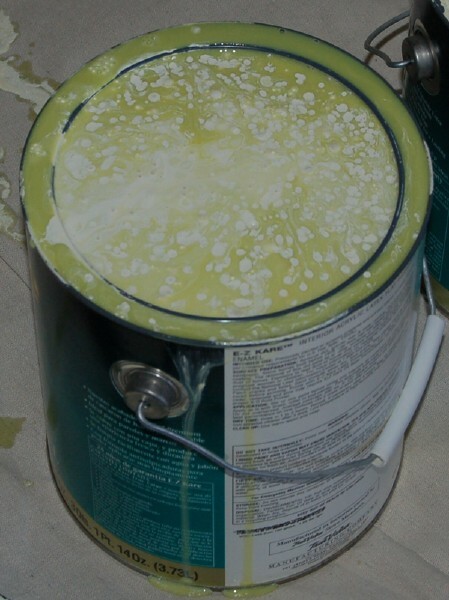 It's latex paint, so I don't imagine it was anything dangerous, but still it was a bit surprising when it happened. I ended up pouring the excess paint into a second can and mixed it all up and it seems to be working ok. I suppose I'll find out tomorrow if it dries properly.